The Three Men on a Bike Team have finally made it to Lands End, after a gruelling 10 day, 926 mile epic cycle ride raising over £40,000 for Children in Need and Music for All. Day 10 Blog will follow later…..
As the deadline for the Three Men on a Bike challenge approaches, Roland’s Directors have started training in earnest. To prove they’re confidence is growing (as their waistlines shrink), Tim Walter, Simon Griffiths and Peter Heath have signed up to take part in the Carten 100 on 12 May. 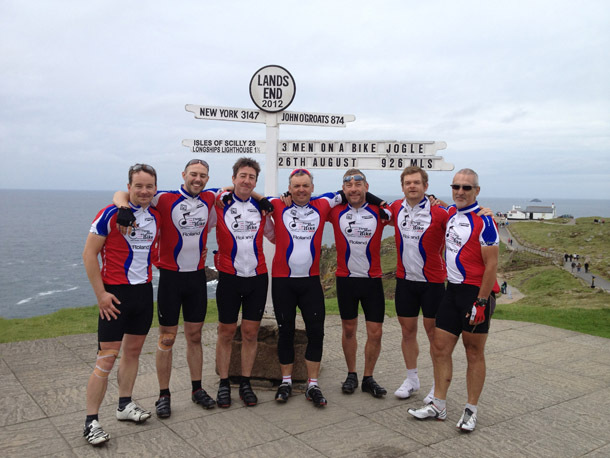 The team will have just one day to cycle 100 miles from Cardiff to Tenby. Joining hundreds of fellow cyclists, the challenge should give them a taste of what awaits in August, when they’ll cycle from John O’ Groats to Land’s End – a total of 600 miles. As they’ve all been putting in plenty of time in the saddle, the scenic ride should reveal a team at the height of the powers – and if it proves thirsty work, the day traditionally ends with a well-earned pint in Tenby. The team hopes to raise £40,000 for musical instrument charity, Music For All and Children In Need when it hit the road in August.